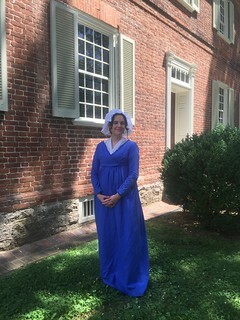 This gown is a rare surviving example of the type worn by servants and the lower classes, or by middle class women for informal wear. 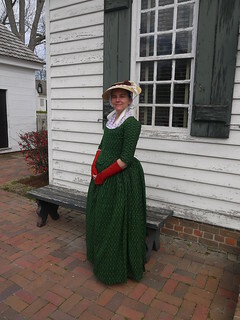 The plain design and the use of cotton fabric are well suited to an informal dress, but also reflect the growing preference for simplicity during the 1770s and 1780s. 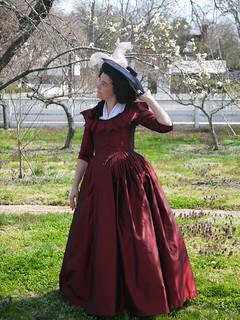 At this time, dresses with closed skirts became popular; called "round gowns," they were put on over the head. The center front closure of the bodice was also newly fashionable; in this example, however, the triangular shape of a stomacher is maintained through unusual robings attached only at the shoulders. Both these and the fronts would have been pinned in place. 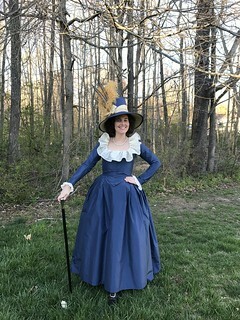 Essentially, a round gown is a dress that was made all in one, pulled over the head and then the join between skirt and bodice is concealed under a front fastening bodice. 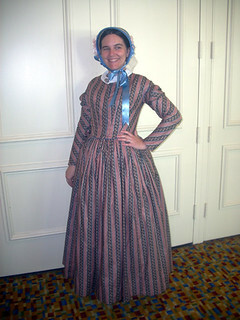 It's simple, flattering, and you see variations on the round gown all the way up through historical fashion. I plan to make many many more in the future.